" EUT is a very nice feature, the machine breathes with you rather than the other way around. " " This is very nice small machine. I ordered it without a humidifier, and immediately regretted it. I ordered the humidifier unit and anxiously await its arrival. " 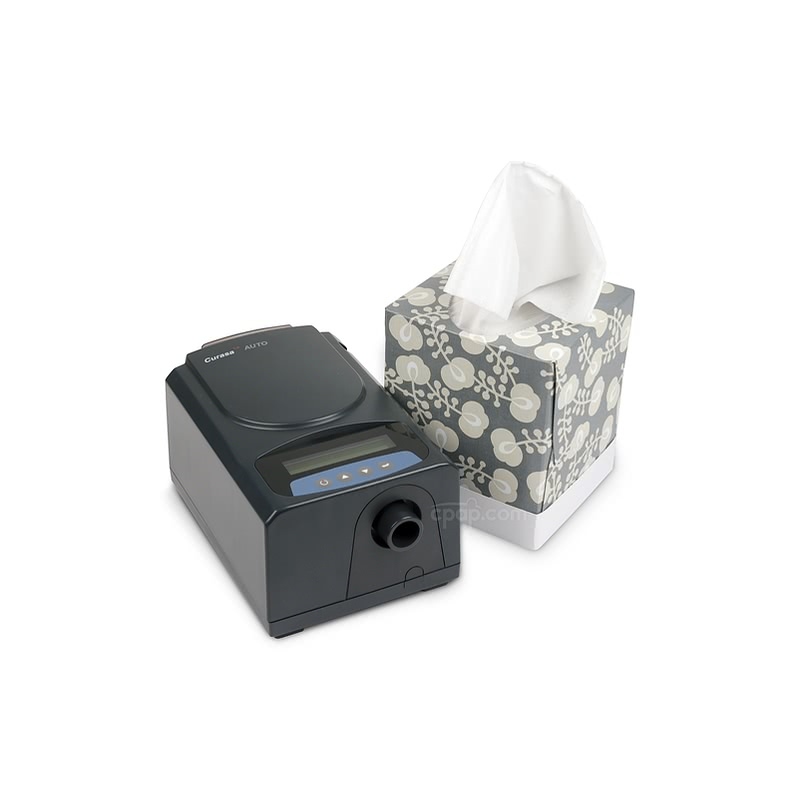 The Curasa Auto CPAP Machine with EUT is a sturdy machine that features modern features to make therapy more comfortable. 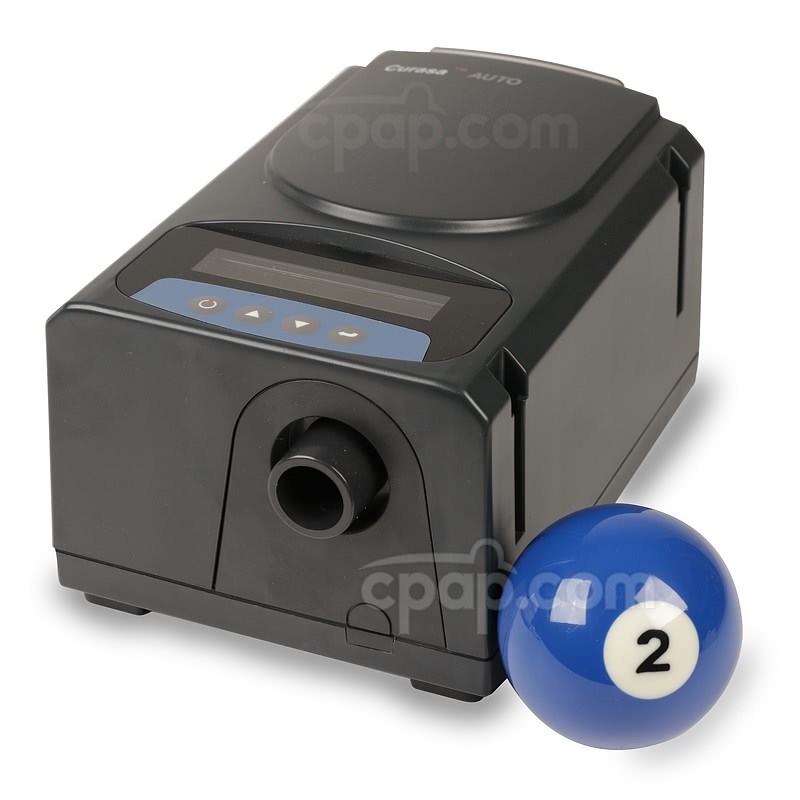 This is an auto-adjusting machine that will adjust on a breath by breath basis to provide the optimal pressure needed. 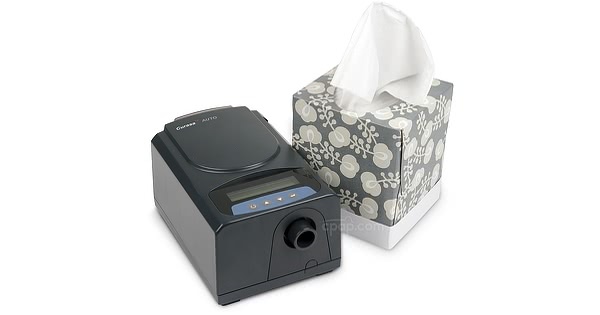 The Curasa Auto CPAP Machine features slots on one side of the machine for the humidifier to latch in to. Rather than having a humidifier with a chamber that is taken in and out, the Curasa humidifier chamber is the humidifier. All electrical components are built in to the bottom half of the chamber. A short jumper cord attaches the humidifier to the machine making for an overall small system. The Curasa Auto comes in at 7 1/8 in L x 4 5/8 in W x 3 1/2 in H, making it roughly the size of a ITEM???. With the optional humidifier attached it measures 9 in L x 7 3/4 in W x 4 in H, which will leave a relatively small footprint on a nightstand. The machine weighs 2.4 lbs alone and 3.3 lbs with humidifier and connector tube. 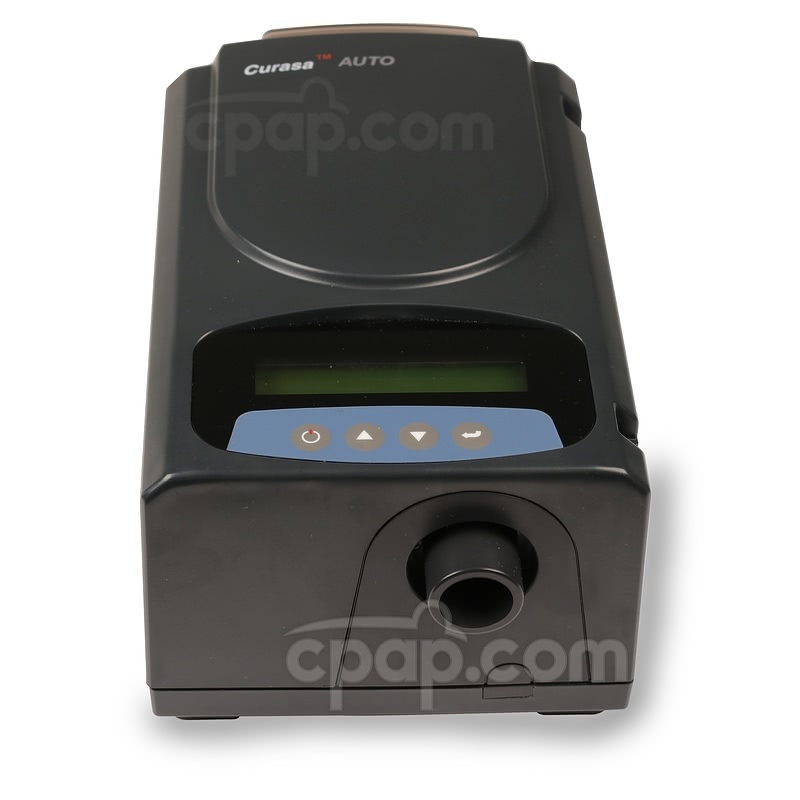 The Curasa Auto features EUT (Expiratory Unloading Technology) an exhalation relief function like many other popular machines. Exhalation relief can make therapy more comfortable and feel more natural. The EUT feature can be set on one of three different levels from a light amount of relief to a larger drop in pressure when exhaling. The EUT feature can also be set to 0 which turns the feature off entirely. The Auto On / Off feature allows the Curasa Auto to detect when the mask is on the user and he or she is breathing. The machine automatically begins providing the therapy air stream without having to press a button. This feature may be turned off if desired. If the AUTOON feature is set to off and the mask is removed or there is a significant mask leak while the machine is blowing air, the mask off alarm will sound. The alarm can be silenced by pushing the up and down arrow keys and by turning the blower off. If the power goes out while the Curasa APAP machine is running, the machine sounds an alarm to notify the user of the disruption in power. To silence the alarm press the power key. The power out alarm will also sound if the power cord is disconnected from the wall outlet while the machine is running. The power out alarm function cannot be turned off. 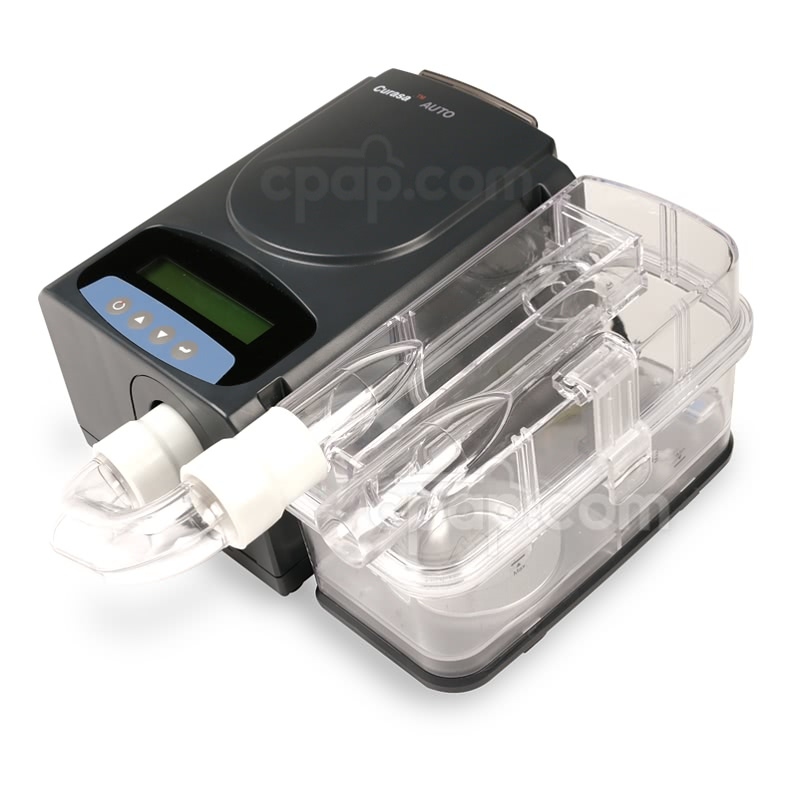 The user manual included with this machine can be viewed and downloaded here: Curasa Auto CPAP Machine. Make sure the device is unlocked. A dash signifies the device is locked, while a star represents an unlocked machine. If the device is locked, use two fingers to simultaneously press the up and down arrow keys for approximately three seconds. With the device unlocked, use the up and down arrow keys to scroll through the display screen. Stop scrolling, when MODE appears on the screen. Please Note: The data will appear slightly different based on the type of machine. On the APAP machine, the words: Mode, CPAP, and EUT0 show on the screen. When selecting to change the mode from CPAP to APAP, navigate the star symbol next to the word 'MODE'. Press enter by selecting the curved arrow button found on the right side of the machine. The word will begin to flash. After the mode has been determined, press the curved arrow to finalize the choice. When selecting to change the EUT setting, make sure the star symbol is next to the word EUT. Press the curved arrow to begin changing the pressure setting. The word will begin to flash. Using the up and down arrow, navigate from EUT 0 to EUT 3. EUT0 is written to show the pressure setting is OFF. The range EUT1 to EUT3 is used to represent the smallest drop in pressure at exhalation (EUT1) to the largest drop in pressure at exhalation (EUT3). Finalize the selection with the curved arrow button. PLEASE NOTE: The heated humidifier is NOT included with the purchase of the machine. It may be included at the time of adding the machine to the cart. DO NOT immerse the humidifier platform (bottom) or jumper cord in water or any other fluids. Turn off the device and allow the humidifier and water to come to room temperature - approximately 15 minutes. Disconnect the humidifier jumper cord from the machine. Disconnect the connector tube between the device and humidifier. Remove the humidifier from the side of the device by pushing up on the humidifier to slide it off the device. 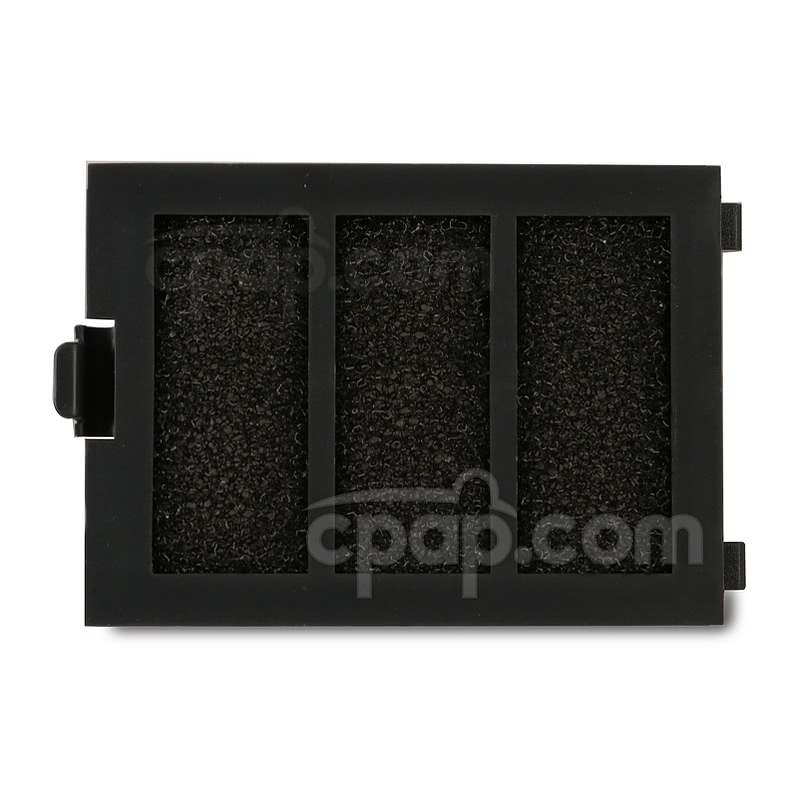 Remove the cap or top of the humidifier chamber. DO NOT get the BOTTOM of the humidifier and jumper cord wet with water or any other liquids. 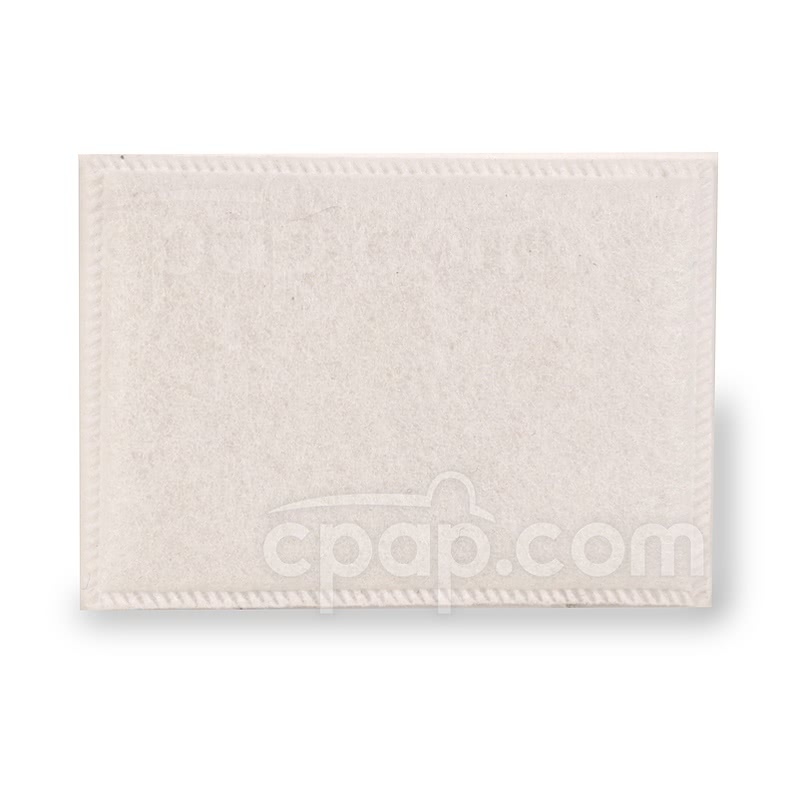 Clean the BOTTOM of the chamber using a damp cloth. The TOP or cap of the humidifier chamber may be washed in clear running water. Allow both the TOP and BOTTOM to air dry, out of direct sunlight. Empty water chamber after each use session and allow to air dry. Disconnecting the Humidifier: Always allow the humidifier and water to cool BEFORE removing the humidifier. Unplug the jumper cord from the machine. Remove the connector tube between the device and humidifier. To remove the humidifier from the machine, push up on the humidifier so it slide off the device. Daily Care of Humidifier: After each use, empty the water from the humidifier chamber. Allow the chamber to air dry out of direct sunlight. DO NOT immerse the humidifier bottom or base in water or any other liquids. DO NOT wash in a dishwasher. With the filter end of the machine facing you, remove the cassette from the machine by lifting the tab on the left side of the cassette. Once the cassette is removed from the machine hold it in front of you with the black filter facing you oriented with the long sides of the cassette parallel with your body. Hold the short sides of the cassette by the frame edges using both hands. Place the flat balls of your thumbs against the outside edges of the black filter. Aim the white side of the filter way from you and towards a table or bed in case the cassette back pops out with force. Applying even pressure with both thumbs, push with the balls of the thumbs to force the back of the cassette to pop out of the frame. 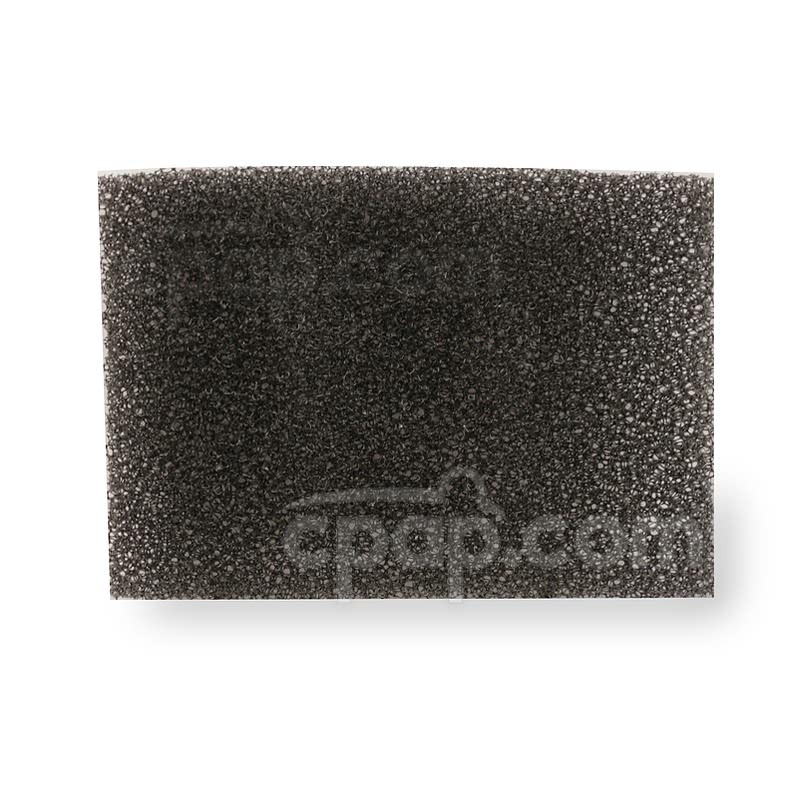 The black foam filter should be washed weekly, allowed to dry completely and reinstalled. It should be replaced around every 6 months. 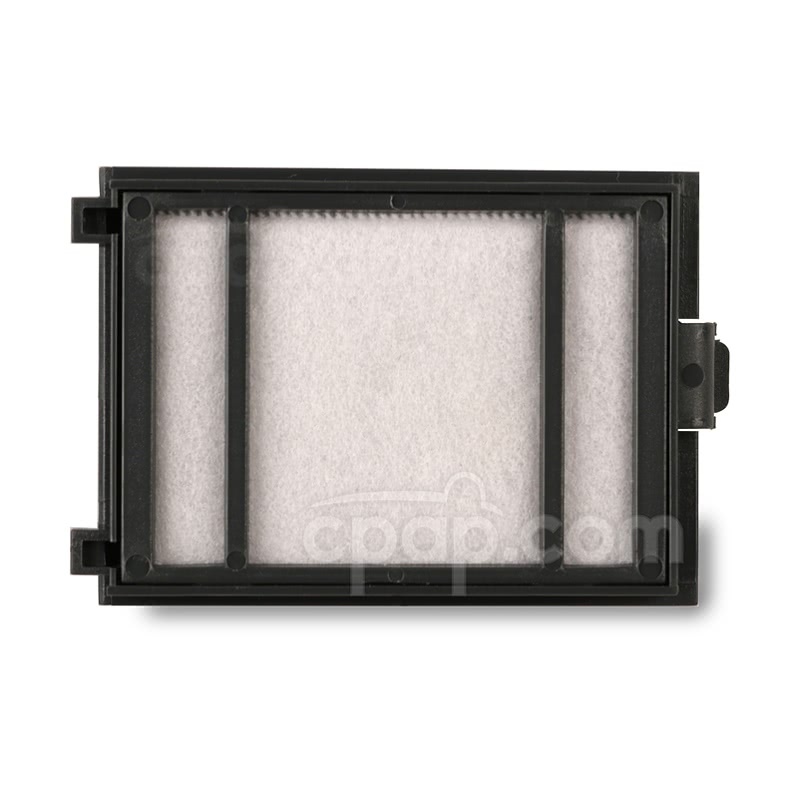 The white fine filter cannot be washed and should be discarded and replaced monthly. The black foam filter goes into the cassette frame first so it will be facing the out when the cassette is reinstalled. The fine filter is placed in the cassette frame second so will be facing the inside of the machine when the cassette is reinstalled. Snap the back of the cassette into place. Insert the cassette into the machine with the flat side of the frame facing out and snap into place. 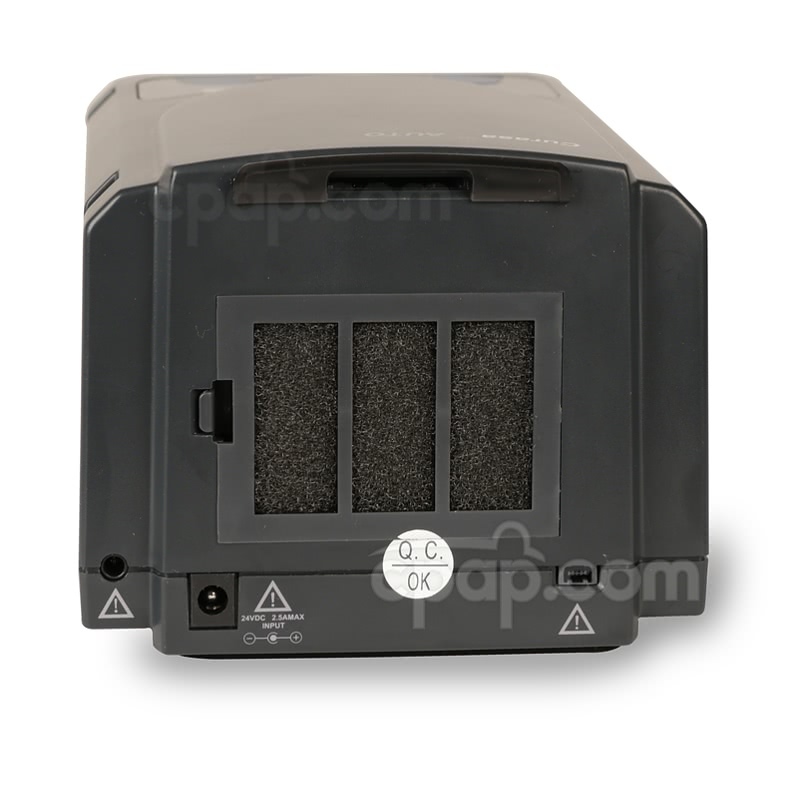 The black filter should be seen when looking at the back of the machine. With the machine plugged in and on, use the up or down arrows to navigate to the menu option "DATA TO MC NO"
With this option selected, press the enter (curved arrow) button once. The option should start to flash. Press the up arrow once to change the option to "YES". Press the enter (curved arrow) button once to save this option. While the machine is transferring data from the on-board memory to the SD card, it will display "WRITING....." on the screen. Do not press any buttons during this time. When the transfer is complete, "SUCCESS" will be displayed on the screen. Press the enter (curved arrow) button to return to the home screen. The data card can now be removed, and the data now on the card can be viewed using the OPTIONAL AutoManager software. If the status shows "DATA ERR" or "ERROR" on the display during the writing process, try uninstalling the SD card and reinstalling, then try the writing process again. If the error persists, try a new SD card. The Curasa machines do not have a setting for a slim or 15mm hose. Only a standard 22mm hose should be used. 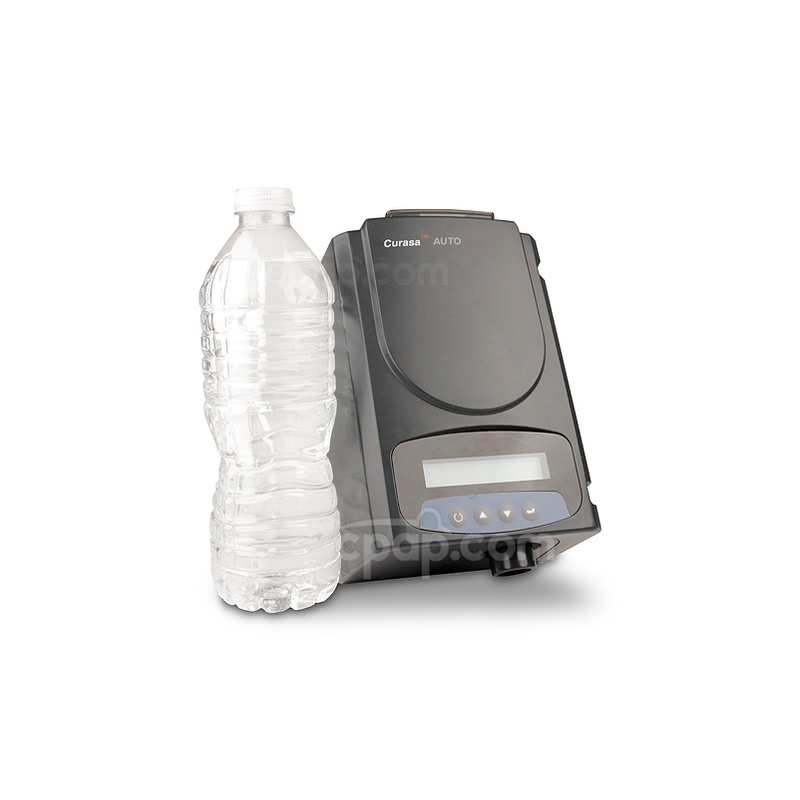 The Curasa CPAP Machine and OPTIONAL Heated Humidifier operate on 110v to 240v AC. 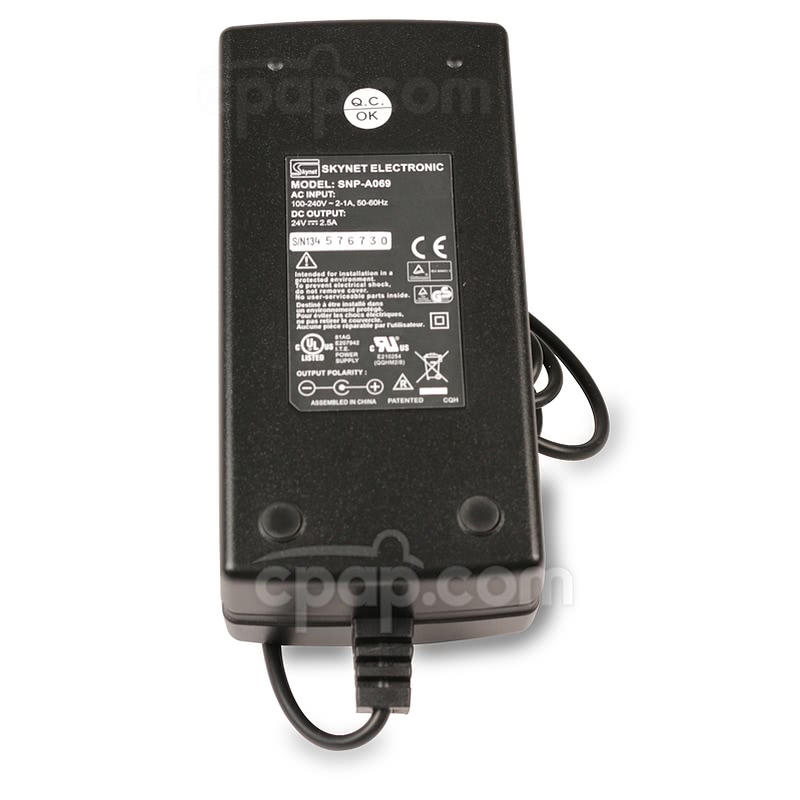 There is no need to changes fuses or switches to operate on 240v, only an appropriate plug adapter for the country. 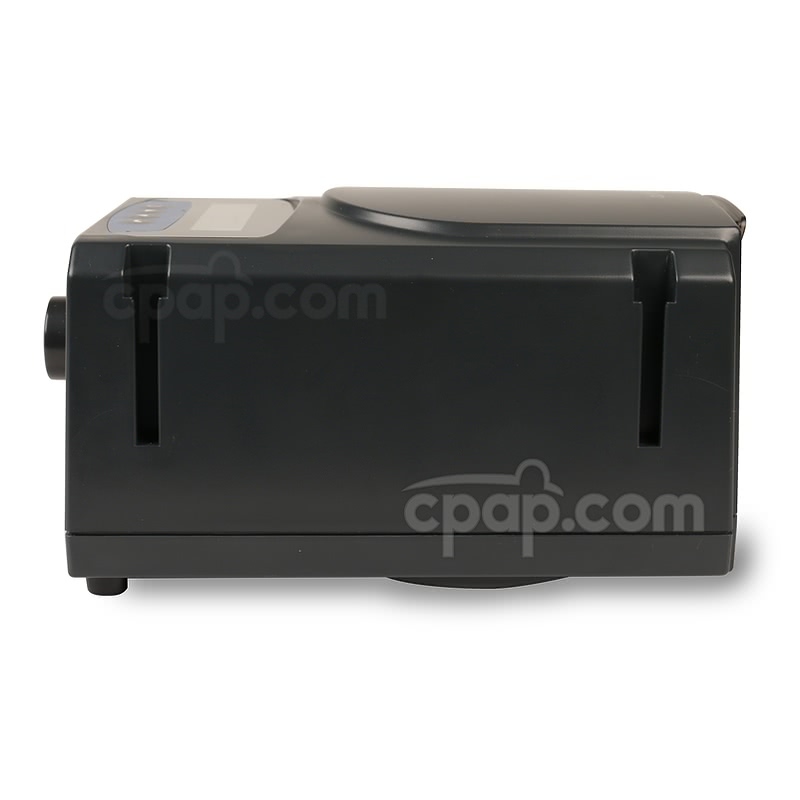 CPAP.com offers the World Traveler Power Adapter Plugs as an option for operation in many European and Asian counties. 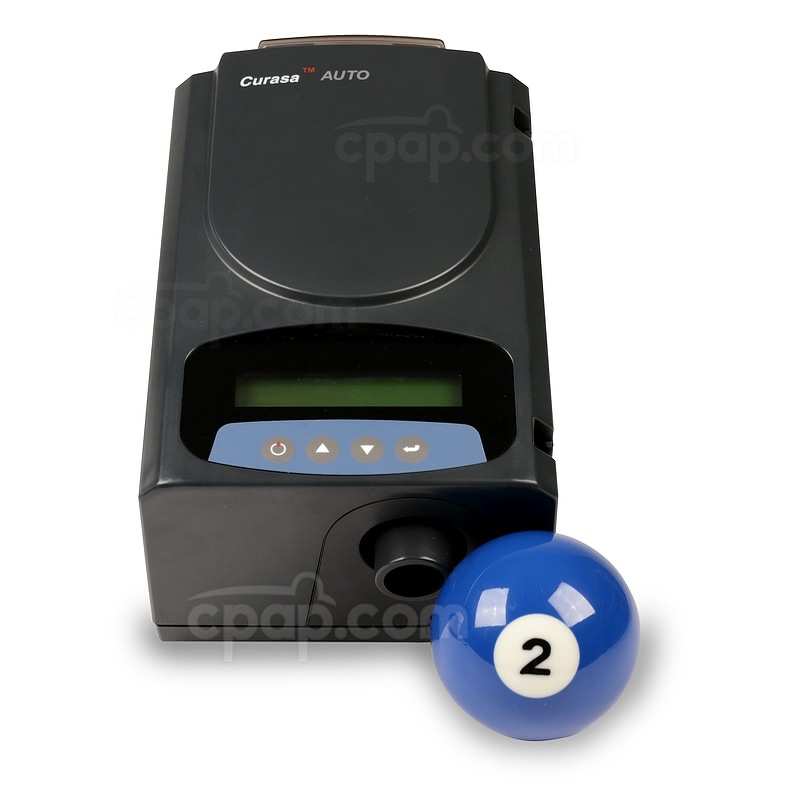 Want to use the Curasa machine while away from AC power? Although the Curasa machine has a DC port, at this time an appropriate DC cable is not available. CPAP.com is working to change that. This kit provides AC power to connect the Curasa's AC cord to the power inverter. Respironics Battery Kit with 400 Watt DC to AC Power Inverter includes the 400 Watt DC to AC Power Inverter and the sealed lead acid Respironics Battery Pack.